We’re so excited to announce that EEBA supports new features on the web! Now you can schedule future transactions, and EEBA has made receiving multiple or irregular incomes easier. 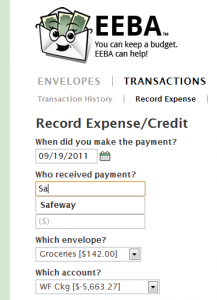 Automatically fill in payees for you when you record a transaction. She even remembers which envelope and account you used for that payee last time! Quick Record transactions from the homepage. 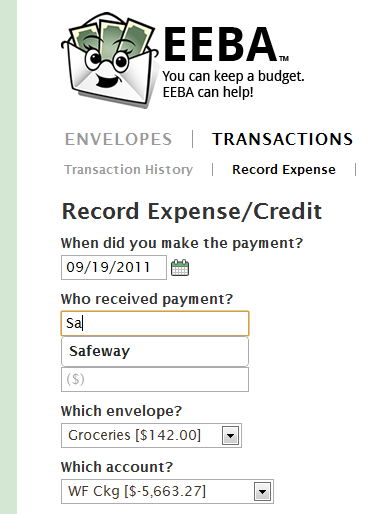 We heard from users that they really enjoyed the ease of being able to quickly record expenses from the EEBA homepage. 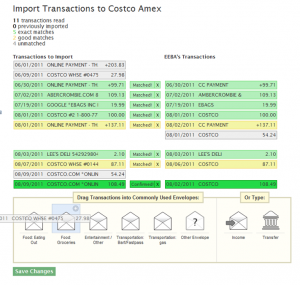 As a result, we’ve expanded the functionality to include not only expenses, but all common transactions. Now you can receive income, distribute, and transfer funds all from the homepage! Keep your Income in a holding pen of Unallocated Money before you distribute it into Envelopes — if you want her to. This comes in handy for organizing multiple or irregular incomes into a steady budget. Look out for a future blog post about how to make this work for you. Let you change monthly envelopes to irregular and vice versa. Plus and Premium users get goodies too! Schedule future transactions. With Scheduled Items you’ll be able to schedule future Income, Expenses, Distributions from Unallocated, and Envelope and Account Transfers. Scheduled Items will be replacing Recurring Transactions, adding the ability to schedule more kinds of transactions as well as the option to post pending transactions on the current day. This is great for your monthly bills, automatic savings plan, and regular incomes. You can even tell EEBA to fund your envelopes for you — set it and forget it! 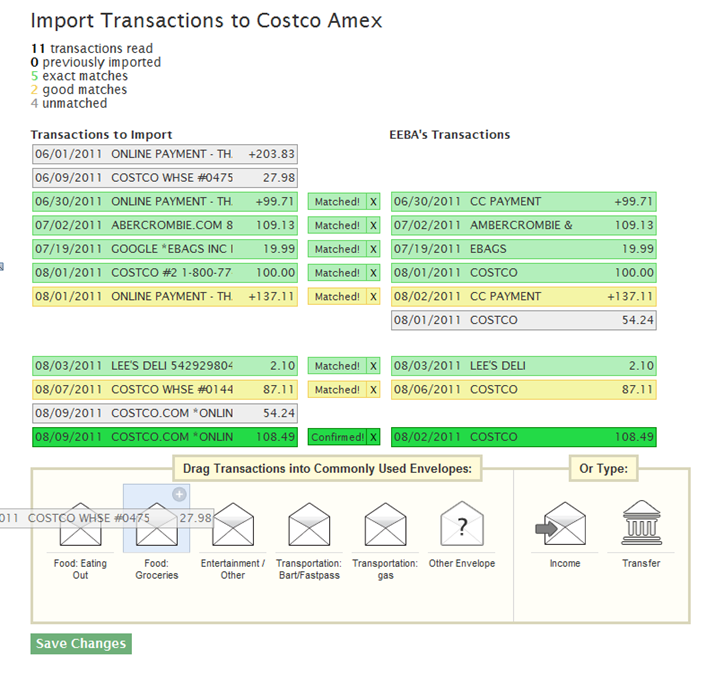 Import CSV files of your bank statements, in addition to OFX / QFX. And… my personal favorite is the change we made to the Import Statement page. EEBA will still match imported transactions with those already recorded in EEBA, but now you’ll be able to quickly categorize unmatched transactions by dragging and dropping them onto a visual list of your most commonly used Envelopes! If you’ve ever had to “catch-up” with your records in EEBA, you’ll be very happy with this change! We hope you like the new EEBA! If you love her, rate her in Android Market, and like her on Facebook. Still missing the option of scheduling a future transaction only once. Workaround now is to schedule it yearly, and then delete it after it’s recorded. Yes, you’re right that we focused on building the functionality of recurring scheduled transactions, since we heard that this was the priority for more users. We have the suggestion for one-time scheduled transactions in our feature tracker. For now, your workaround is a good solution for people who need it. Thanks for sharing it! Does EEBA automatically sort the reoccurring transactions on my bank statement and then require me to sort the unique transactions? Hi Dave – When you import a CSV of your bank statement, Goodbudget will automatically match transactions that you’ve recorded manually or scheduled transactions with ones on your CSV that are within 4 days and the nearest dollar. All of the other transactions you will have to manually sort by dragging and dropping them into their corresponding Envelope. I spelt a payee wrong, and now whenever I go to pay them, it’s always still listed as an option. How do I clear/reset my payee memory/options? Hi Christine – Sorry for the trouble! First, try correcting the error by editing that transaction. Then, if you’re on your phone, you may need to log out and then log back in to refresh the local data that’s stored on your device. Hope this helps!